Disclaimer: I have changed careers and no longer will be making updates to any materials but am happy to share them with you for free. ¡Barcos de Batalla! 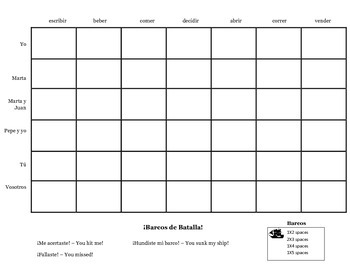 is a fun way for students to practice conjugating regular -er and -ir verbs in any tense. 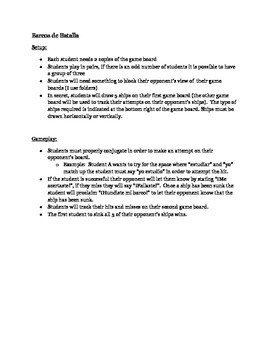 Students play in pairs and must correctly conjugate -er and -ir verbs in order to make hits on their opponent's ships. The element of competition keeps students engaged and the repetition of conjugating helps solidify their understanding of -er and -ir verb conjugation.